Le Rose Suite Hotel of Rimini is a hotel on the wonderful Adriatic sea. Rimini's sea had the blue flag many time, guarantee of the quality of its waters. The Hotel is situated in Marina Centro, along Avenue Regina Elena, with its elegant storees, the coffee shop, the fashionable ice-cream shops, where you can have pleasant evenings walk. Le Rose Suite Hotel in Rimini promises an high quality relaxing holiday, for a cheap cost. 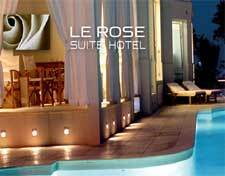 Le Rose Suite Hotel of Rimini, has a central position in Marina Centro, on the beach. The Hotel has approached directed the beach, where the hosts will be able to recharge themselves from daily stresses abandoning itself to a total relax under the sun, or to be useful for the areas fitness, to play beach volley, calcetto, tennis or regenerating in jacuzzi. For children there are areas equipped with toys, elastic carpets, slides, see-saws. Who entrust to Le Rose Suite Hotel will enjoy a punctual and highly qualified service, inside of an elegant structure in modern, colonial style, with 48 suites endowed of every comfort.